Our Apex Legends Map guide has tips for looting King's Canyon and loot tier details for each zone. Having selected your Legend and formed a team, the first thing you'll want to do when you load into Apex Legends is work out the optimal place for your squad to land. The map overall goes by the name of King's Canyon, and it's a pretty generous playable area which is packed with different zones. From forests to mountains, industrial zones to rural towns, there's plenty to explore as you learn the game. Given all these varying locations, it's important that you become acquainted with each one and work out the best way of safely exploring them. You'll find that some areas require a focus on close-quarters combat, while others are practically designed for snipers to exploit. In our Apex Legends map guide we've outlined everything we think you need to know about the map, starting with an image that should give you a solid overview. We've also added in a few thoughts further down the page about what you can expect when you land in some of the most popular zones. The map will likely evolve over time, and we'll have more updates for you as the game develops. First up, here's a shot of the Apex Legends map. After that we've got some detail for you on the individual zones. There are some quite notable spots to explore in Apex Legends which will help your gearing up efforts a great deal. We'll be heavily updating this section once we've spent some more time with the game, so stay tuned for updates very soon! Artillery is an area that notably contains two massive hangars which are quite often stuffed to the brim with loot. Just be aware that while it's quiet due to its location, you will likely need to hot-foot it out of here once the circle starts closing in. Don't forget to explore the western tunnel before leaving here, as there are lots of supply chests. 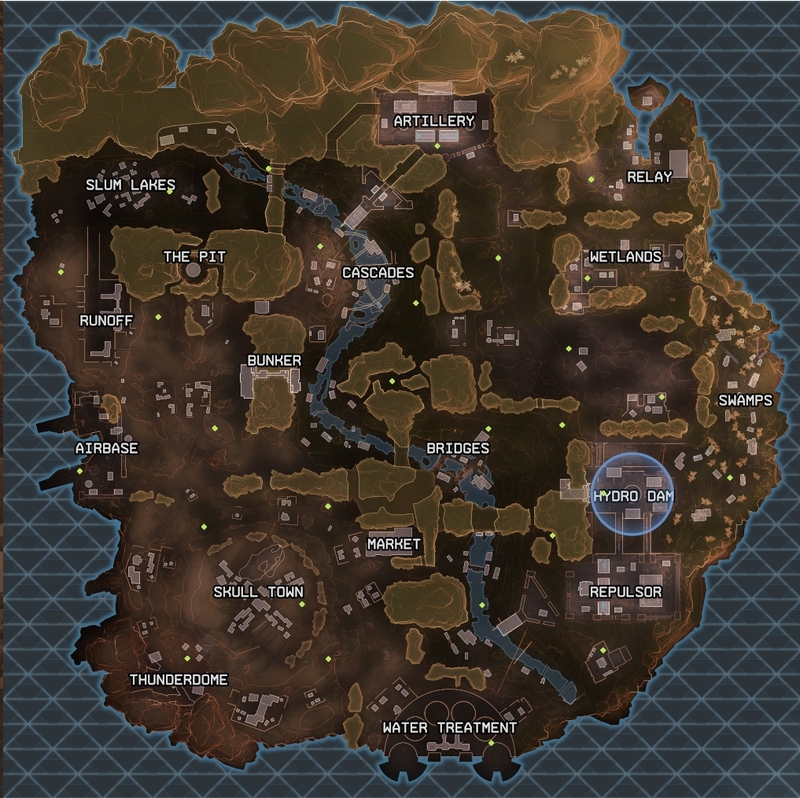 This zone has great loot, but expect a tonne of enemies if you land here - it's a super popular starting spot in Apex Legends. Make sure you aim for a door upon landing so you can get to all the good stuff as fast as possible, and get out of harm's way too. Keep in mind as well that if you choose to visit Hydro Dam later on in the match, there are some deadly sniping points dotted around this locale. Being slap bang in the middle of the map means you can expect some stiff competition if you land at Market. The good news is that there's also plenty of loot lying around, but be warned that there's a big open space between the two rooms which will leave you very exposed to enemy fire. Make sure you loot the nearby cave and houses before moving on, as there are some good looting opportunities to be had. Relay can be found over in the north-eastern corner of the map, and it's a pretty reliable source of loot for your early-game gearing up efforts. Very few teams tend to cluster here as well, which means new players will find things a little less frantic. Getting some solid gear early on will definitely help you get to grips with the game. A shanty town with a big ol' skull running across it. There are plenty of buildings to loot here and a lot of vertical space to toy around with if you do encounter any resistance. It's also been surprisingly unpopulated whenever we've dropped at this location, so give this spot a try if you want to gear up fast. Again, another location filled to the brim with loot. Usually there aren't many people here either, so you can wander over to Skulltown once you've stripped it bare. Do be careful if another squad lands with you though, as it's quite a small area. We'd prioritise snapping up loot quickly and getting aggressive if you spot any resistance. This way you'll stop them from running off with all the goodies, after which you can carry on looting in - relative - peace. Unmarked on the map, but very much underrated. It lies right between Cascades and Wetlands, or south of Artillery if your coming from that direction. While it's pretty open - which could leave you vulnerable if another team drops here - there's an absurd number of supply crates to gear up with. As you might have noticed from your UI, different zones in Apex Legends have different loot tiers. The higher the tier, the better the loot you'll get from exploring them, but that also means you can expect more competition. In this section of our Apex Legends map guide, we've broken all of the zones down into their respective loot tier. The map will very likely change over time, and so we'll update this section of our guide if the advice changes.